Jake wants to get started on his road trip. When you hit the road with your dog, you have to do some planning. Some folks insist on having a new dog tag engraved with the address of where you will be staying, just in case your dog gets lost. Jake has a microchip with our address and phone numbers, and my cell phone is on his tag. In addition, take a photo of your furkid, in case he does get lost. I have plenty of pictures of him in my cell phone. Jake does not get traveler’s tummy, but I take Pepcid just in case. Jake loves to stop and walk in a strange place, so getting your furkid out to walk will increase your travel time. As for me, I don’t leave him alone in the car any longer that it takes me to get out and use the bathroom – and I rush while I do that. Cars can heat up fast, and evil people like to steal dogs. I park as close as I can to a main entrance and check if anything looks suspicious. I don’t travel alone often with furkid. If you have a human traveling companion, the trip is much easier. Taking your furkids on the road means hauling almost as much stuff as you would if you had human children in your car. 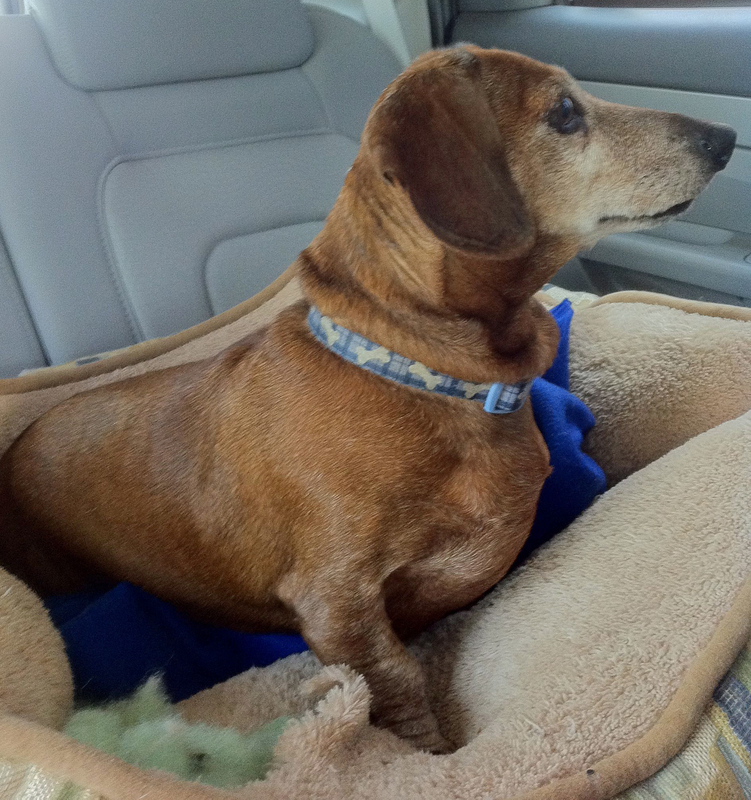 This entry was posted in Dachshunds, Dog Accessories and tagged Dachshunds, Dog Behavior, Traveling. Bookmark the permalink.